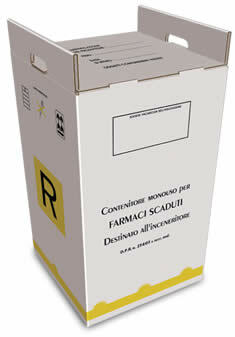 All ALLPACK special waste containers are made of corrugated board of the highest quality, comply perfectly with the qualitative and dimensional characteristics of prototypes approved by the BVT Institute and are compliant with applicable ADR legislation. 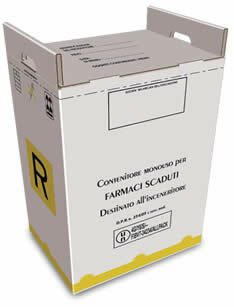 They have passed all necessary tests to obtain the type approval required by applicable legislation regarding the collection and transport of hazardous medical wastes involving risks of infection. The containers are of the folding type for easier use; just a small pressure applied on the corners and they are straight away ready for use. Inside the container is a polyethylene bag to be closed using the small strap provided. The cover features a temporary and definitive fastening such as to ensure the material does not come out even in case of falls. Our containers are type-approved for all types of transport: land, rail, sea and air. Corrugated board containers, 2-color flex print, complete with inside polyethylene bag and self-locking strap for final closing. Provided with two safety flaps for transport and storage.